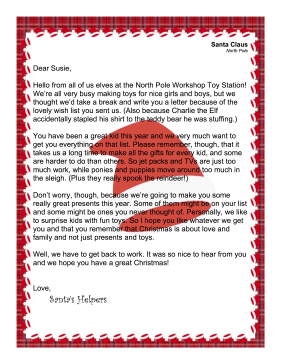 Instead of coming from Santa, the workshop elves write this free, printable letter to the child. They talk about present wish lists, and how some toys are too big or complicated to make. Don't worry, though, because we're going to make you some really great presents this year. Some of them might be on your list and some might be ones you never thought of. Personally, we like to surprise kids with fun toys. So I hope you like whatever we get you and that you remember that Christmas is about love and family and not just presents and toys. Well, we have to get back to work. It was so nice to hear from you and we hope you have a great Christmas!